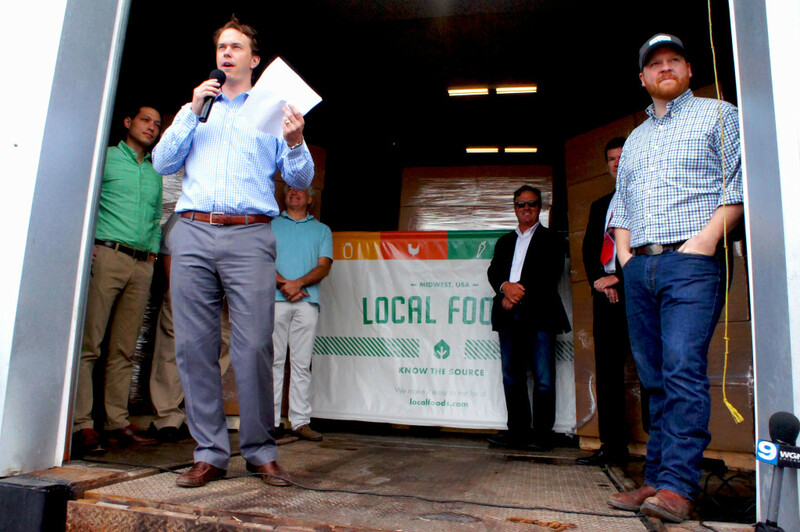 Local Foods is a Chicago grocer and distributor that sources its produce, meats, cheeses, dairy, eggs, packaged foods and beverages from Midwest producers. Located in the city’s Bucktown neighborhood, it includes Stock, a casual café with gourmet-quality food, and The Butcher and Larder, a nationally regarded meat shop that moved from its own location to Local Foods’ retail store when it opened on June 30 last year. 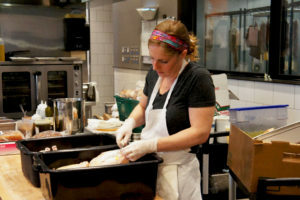 Abra Berens is the chef at Stock, and she approaches the concept of farm to table dining with the ethos instilled in her as she trained at such legendary locations as Zingerman’s Deli in Ann Arbor, Michigan; Ballymaloe Cookery School in Ireland; and Chef Paul Virant’s Vie restaurant in suburban Chicago. She became so committed to local and sustainable food that she started her own farm in Michigan. Now at Local Foods, she gets nearly all of her ingredients from the shelves and warehouse. And her experience there has made her all the more committed to avoid wasting these precious products, at a time when when a third or more of the food in the United States goes to waste. As you will read below, she is a powerful advocate of “root to leaf” dining as well as “snout to tail” dining, and her efforts were highlighted in an article in Bon Appetit magazine‘s March 2016 issue. If you are in the Chicago area, you can meet Berens and her colleagues at Local Foods’ 1st anniversary celebration this Saturday (June 25) from 11 a.m. to 5 p.m. at the store, located at 1427 W. Willow St. Admission is free but an RSVP is requested (click here to register). Well, always. But now that the ability to source local and sustainably raised ingredients is becoming easier and easier, it is our job — as chefs and consumers — to focus on not wasting any part of those supremely sourced ingredients. Minimizing food waste is the next round of work that we have to do, both in the farm to table movement and in our food culture generally. I will explain how and why food waste became such a priority for me, but first a little background about how I got here and grew a passion for local food so strong that I started my own farm. I started cooking for real at Zingerman’s Deli in Ann Arbor, Michigan. The importance of high-quality ingredients has been a part of their business since the day it opened (“You REALLY can taste the difference.”). It was there and under the tutelage of Rodger Bowser, the chef and co-managing partner, where I was encouraged to taste ingredients side by side to build a flavor memory and learn to discern the nuances of taste. He also was the first chef to chastise me for cutting off too much of the onion when removing the skin. When I decided I wanted to continue on in the food world and go to cooking school, it was Rodger who pushed me into the arms of Darina Allen at Ballymaloe Cookery School in Ireland. From her cooking school, situated on a 100-acre working organic farm, the commitment to impeccable ingredients solidified. Ballymaloe practiced what they preached. There were several vegetables that we never learned to cook because they weren’t in season during the three months that I was in Ireland. No strawberries, no asparagus, no peas, no peaches or apricots. But that didn’t occur to me until I was home. They weren’t missed. And that was the start of a mental paradigm shift that is now permanent and critical to my style of food. If it isn’t in season or around me, it doesn’t make it into the dish. More accurately, it doesn’t even make it into the thought of the dish. This was a deliberate choice, though an almost unconscious action, because it was reinforced by every single restaurant where I’ve chosen to work. After cooking school, I moved back to Chicago and found my way into the kitchen at Vie restaurant in Western Springs. Chef Paul Virant and his restaurant teams are among the most through and through farm-to-table restaurants in city and its suburbs. What that means, in my eyes, is that the glamorous parts of the menu are locally sourced, but so are the guts of every dish. Menus are barely long enough to list the farms where the primary proteins on the plate come from, let alone each onion, clove of garlic, herb. But for Paul, the foundations of the dishes are just as important to source sustainably as the glistening lamb chop, wedge of cheese or filet of fish. I stand on the shoulders of the chefs who have come before me and who emphasized these ingredients. Their demand for product, information on growing practices and knowledge of the land has pushed me to be a better chef. To continue my food education, in 2009 I co-founded Bare Knuckle Farm, my small-scale vegetable farm in Northport, at the far north of Michigan’s Lower Peninsula. While learning to be a grower, I found solace in something I knew how to do: make dinner. 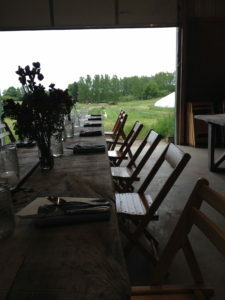 Since the advent of our farm, we’ve hosted private dinners using ingredients sourced exclusively from our farm or other farms in Leelanau County. These dinners pushed me to really look around, see what was available, what needed to be used, and develop ways to utilize a limited cadre of inputs to make unique and ever-changing menus. It took farming for me to realize the reason that buying local food is important to me is mostly because of the people behind it. I wanted to support their work because I suddenly knew how much work it takes to grow a single carrot or head of cauliflower. And, to circle back, this respect for the work of these local farmers is why I am passionate about not letting it go to waste. I now no longer have my hands in the dirt each day. 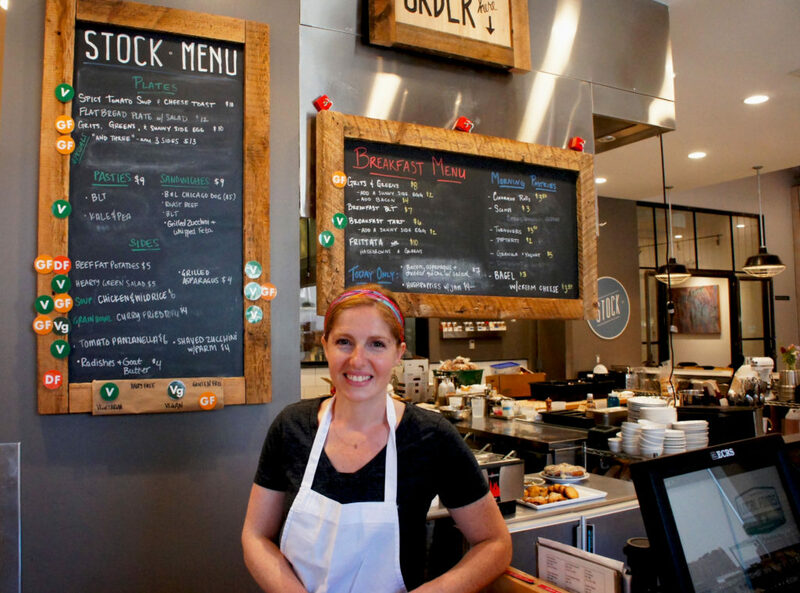 I run Stock — the café at Local Foods, located in the one-year-old retail store developed by the company of the same name that also distributes locally and regionally produced food to restaurants and other customers in Chicago. Everything in our warehouse has a story and comes from a known pair of hands. Like the farm dinners, everything we cook comes from nearby. But unlike the farm, there are lots more times when food becomes not perfect enough to sell. Kale gets wind-whipped in the cooler and no one will buy it. A tomato stem stabs the flesh in transit and no one will buy it. A shipping pallet punctures a bag of rice and we aren’t allowed to sell it. Milk is three days away from its sell-by date and we won’t sell it. We got in fresher strawberries, and so what happens to the ones that were last from the last delivery? I am dedicated to using that entire product. I can no longer throw away broccoli stems and leaves because I feel like I’m throwing away time and money. Not mine. Theirs — the growers, the pickers, the packagers and the warehouse workers who have looked after it. And being careless with others is disrespectful. We are more familiar with not wasting a single part of an animal, but that theory should be equally applied to vegetables. Ugly or imperfect produce took just as long to grow. It tastes just as good if you train yourself to see how to use it. Wilty kale, you belong in a sauté pan, not the compost. Wrinkly tomato, see you in tomato sauce, not the trash. Strawberries containers with one moldy berry, you will be separated and the good ones turned into jam. We work every day to not throw the baby out with the bathwater. Looking back on it, I learned this lesson at Ballymaloe as well. As students we would quake in terror when Darina or her mother-in-law (and Ballymaloe matriarch) Myrtle Allen would go through the compost buckets. Did I zest each lemon? Did I cut off too much of the onion top? Please don’t find the poorly butchered chicken carcass in there because I was too lazy to make stock! And they found it all. Sourcing is important because it is the people who are the sources and we are prioritizing paying them for their work and their know-how. And then using the whole thing — snout to tail, root to leaf, the flesh around the bruise — because it’s the right thing to do. And it is the right thing to do even if you don’t know the hands that grew your tomatoes. 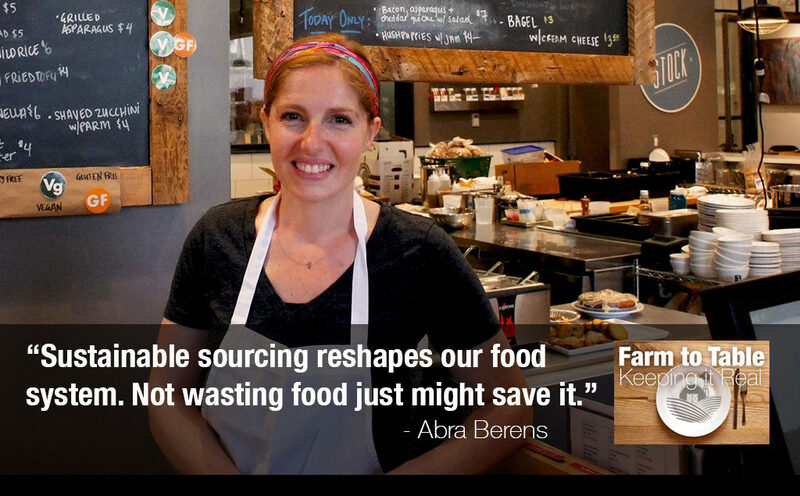 Sustainable sourcing reshapes our food system. Not wasting food just might save it. This entry was posted in Chef activism, Chef advocacy, Family Farms, Farm to table dining, Farm to Table: Keeping It Real, Fast/casual restaurants, Food activism, Food education, Food Entrepreneurs, Food Hubs, Food waste, Good Food Dining, Good Food restaurant trends, Local Food, Sustainable dining, Sustainable food retailing and tagged Abra Berens, Ballymaloe Cookery School, FamilyFarmed, food waste, local food, Local Foods Chicago, reducing food waste, root to leaf cooking, Stock Cafe at Local Foods, sustainable dining, sustainable food, Vie restaurant, Zingerman's Deli. Bookmark the permalink.